Building a website is a lot like cooking your favorite dish. You take all the ingredients, toss them together, then taste test it to see if you missed something. However, not everyone does this and they find themselves scrambling to fix various errors from 404 Page Not Found to slow page load times. Checking your website as a one man operation may feel a bit overwhelming, but it really is a simple process. It will take some time though, to walk through all the aspects of your website. But in the end, all the hard work you put into making the website and testing it will pay off for you. It would be wonderful if every website on the internet had a team building it, from the writers and editors to the network administrator. In an effort to make sure that you built your WordPress site correctly and all things work as intended, we have compiled these 11 checks you should perform before your site is live. It should go without saying, but typos happen all the time. Reread your own content to see about spelling or grammar errors, or use an online tool. This will make you look better in the long run because it will appear more professional. This makes your website more readable and enjoyable to your visitors. Make sure your contact forms all work as intended. This includes what information you need to gather, their appearance, and their buttons. If your forms are unnecessarily long, you risk losing your visitors. Online forms may not be the highlight of a website, but they should reflect your website's brand and be an inviting thing. Forms are an integral part of every website, make sure yours fit the bill for your visitors. Websites and images go together perfectly, there is no denying this. You would be hard pressed to find a website that doesn’t have any images. Making sure that they are web optimized, tags and descriptions are all filled out correctly, and make sure they aren’t draining the resources of your site to cause slow load times. Use a caching tool and a compression tool so that your images display correctly and load quickly. Your website’s loading time is an ever important commodity. Google has been including site speed as a determining factor for their page rankings. Aside from page ranks, site speed directly impacts all forms of ecommerce, and can be a leading cause as to why business isn’t as good as it can be. You can use an online speed test tool to see how your website stacks up. The faster your site loads the less revenue you potentially lose. Remember, time truly is money online. Much like the site speed above, Google is penalizing websites which aren’t mobile friendly. However, there are more responsive WordPress themes hitting the markets each and every day to make sure you can get a theme that you truly love and is mobile friendly. Mobile internet use is surpassing desktop internet use by leaps and bounds because of the ease of use mobiles grant people. Be ready for them no matter their device. Ensure that your navigation bars, footer links, and any side bar links actually go to where they are supposed to. You can also use an online link checking tool to ensure that you don’t have any broken links. It doesn’t take long to cycle your way through a website just to make sure that all the links work correctly. Occasionally, 404 errors happen. But having a custom 404 with a sitemap can help the lost visitor out in their time of need. Designing a 404 error page isn’t complicated and having one up just in case when you are doing routine maintenance doesn’t hurt. Fixing them as they crop up however, is just as important as trying to ensure they don’t come up at all. This can often be overlooked as we write posts for our blogs. However the fix can only take 5 minutes. To facilitate the web bots crawling your site faster and attaining better rankings you should have proper titles and metadata for each post. With everything that a good analytic tool can provide, make sure everything is configured and connected. Making sure your analytical tool is connected will give you the insights needed when your product, service, or blog goes live in how to best serve your visitors. Social media today is almost like word of mouth yesterday. Ensure that each profile is correctly connected and filled out. From a social perspective, nothing could be worse than having your buttons link to the wrong accounts. Don’t forget to install a social sharing plugin that will look good on both desktop and mobile so your readers can share your posts across their social media channels. Social media is an all too important feature for any website. Make sure your social media is able to hit the ground running. Google is now setting a new precedence and requiring all websites, not just ecommerce sites to go from http:// to https://. Personal privacy is the main reason for this shift. This is the new standard for protecting all users of every website. 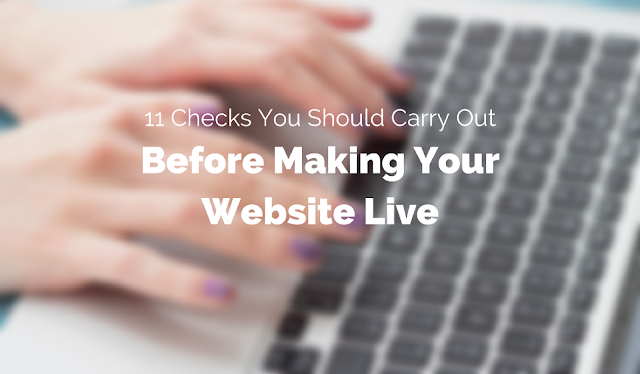 There are a lot more items that you can check out to make sure your website is ready to go live, but these eleven checks will help you get the most important items off your list. Double checking your website to ensure everything goes smoothly on launch day will ensure that everything works out for days to come. Knowing your website is ready for the launch will allow you to focus on creating more content and promoting it on social media and across the Internet so you get the initial traffic and start growing your audience the right way.